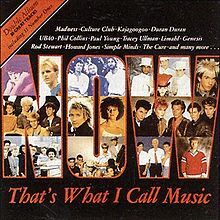 Now That’s What I Call Music or Now 1 is the first album from the popular Now! series that was released in the United Kingdom in 1983. Initial pressings were released on vinyl and audio cassette, with a re-release on CD in 2008, celebrating the 25th anniversary of the album and series. It reached number one on the UK Albums Chart. Becoming one of the biggest albums of the year, it became one of only a few compilation albums to reach #1 on the UK & Ireland album chart, staying there for four consecutive weeks and five in all. It also went 3x platinum, selling over 900,000 copies.